Restarting No. 4 nuclear plant project could cost NT$70 billion: AEC Focus Taiwan, 2019/03/14 Taipei, March 14 (CNA) It could cost an estimated NT$60-70 billion (US$1.94-2.26 billion) and take at least 10 years to revive the mothballed fourth nuclear power plant at Longmen in New Taipei’s Gongliao District, Atomic Energy Council (AEC) Minister Hsieh Shou-shing (謝曉星) said Thursday. However, Hsieh said that a decision to search for a final disposal repository for radioactive waste has not been reached and he declined to answer the question of when the location of a final repository can be determined, because no cities or counties in the country are willing to have such a facility in their localities. Hsieh was responding to a legislator’s questioning about restarting the nuclear plant project during a legislative hearing, as the topic has sparked considerable debate after pro-nuclear energy activists recently proposed a referendum on the issue……..
the ministry also cited Taipower estimates that it would require about NT$47.8 billion to revive the nuclear plant and put it into commercial operation, adding that the amount could be even higher than that. The Department of Energy needs better financial oversight of the subcontractors hired at sites like Hanford, concluded a Government Accounting Office report released Tuesday. It found issues with a lack of audits covering costs charged to the federal government and conflicts of interest — citing a Hanford nuclear reservation civil case as an example of what could allegedly go wrong. Most of the $30 billion DOE budget goes to contractors, most of which spend money on subcontracts, the GAO said. “Yet (the Department of) Energy has not clarified which subcontracts should be audited and what an audit should entail,” said the report. Brazil’s energy minister said the country plans to sign an accord next week with President Donald J. Trump that could pave the way for U.S. companies to explore the Latin American country for uranium and invest in new nuclear-power plants. Bento Albuquerque, a former admiral who once ran the Brazilian Navy’s atomic program, met with U.S. Energy Secretary Rick Perry in Houston this week and discussed creating a bilateral forum on energy cooperation that would include nuclear projects. That’s expected to be part of a memorandum signed by Brazilian President Jair Bolsonaro on his first trip to the White House next week, Albuquerque said Thursday in an interview. none has ever been found. effectively zero fuel costs of electricity from wind and solar. A billion dollar bailout for Three Mile Island Nuclear Station? Bailout bill proposed for Three Mile Island nuclear plant, 21 News, by Jessie McDonough, March 9th 2019 MIDDLETOWN, PA — A 981-million dollar bailout will be proposed next week to keep Three Mile Island Nuclear Plant afloat. 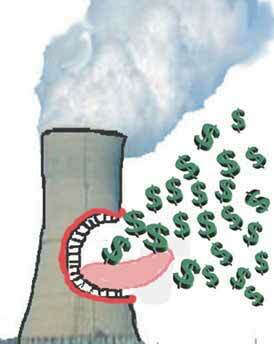 MIDDLETOWN, PA — A 981-million dollar bailout will be proposed next week to keep Three Mile Island Nuclear Plant afloat. Republican representatives want to amend Pennsylvania’s Alternative Energy Portfolio Standard by adding nuclear energy to the plan. Energy providers will have to buy a certain percentage of nuclear which would lead high utility bills for you the consumer. The proposal would bail out two nuclear energy plants. One of those is Exelon’s Three Mile Island. Not everyone is on board with the proposal and its’ hefty price tag. “We are talking almost a billion dollar nuclear bailout and basically it is a tax on consumers. It is going to force energy prices to be higher”, said Commonwealth of Pennsylvania CEO Nathan Benefield. Fukushima nuclear workers still facing radiation danger, eight years on. Eight years after Fukushima nuclear meltdown, workers still facing radiation risk https://www.peoplesworld.org/article/eight-years-after-fukushima-nuclear-meltdown-workers-still-facing-radiation-risk/ February 22, 2019 BY SHIMBUN AKAHATA eight years since the nuclear meltdown at the Fukushima Daiichi Nuclear Power Plant. The NPP operator, Tokyo Electric Power Company (TEPCO), says that it will soon conduct a probe into the containment vessel of the No. 2 reactor in order to find out the condition of the melted nuclear fuel inside, which means that TEPCO has yet to obtain even such basic information. In another survey of residents conducted by municipalities near the Fukushima plant, among the respondents who decided not to go back to their hometowns and who cannot decide whether to do so, many cited worries about the safety of the plant as a reason. The government of Prime Minister Shinzo Abe, however, is still encouraging Fukushima evacuees to return to their homes, but as the nuclear disaster drags on. The use of nuclear power in Germany will come to an end by the end of 2022 as planned, operators of the country’s remaining nuclear plants have told the Frankfurter Allgemeine Zeitung in reaction to a survey in which almost half of the respondents said nuclear plants should run longer than coal plants. Energy company EnBW said that the political regulation means that “nuclear energy is finished in Germany,” adding that its two remaining plants would be deconstructed right after they are taken off the grid. Ralf Güldner, head of the German Nuclear Forum, said ending nuclear power while at the same time phasing out coal and struggling to expand the power grid could mean that Germany’s autonomous power supply security becomes threatened. However, Güldner too said the political situation was “very clear.” Plant operator Preussen-Elektra said “we certainly don’t think about any plan B.” According to the article, operators say that they will not have qualified staff anymore to keep nuclear plants running longer than agreed. In the survey, 49.5 percent of respondents said the planned decommissioning of the last nuclear plant by 2022 and of the last coal plant by 2038 is the right order, while 44.1 percent said closing nuclear plants before coal plants is wrong from a climate perspective. If the Czech Republic issues a tender to build a new nuclear power source, Rosatom will send a proposal, the Russian Minister of Industry and Trade Denis Manturov told journalists after a bilateral intergovernmental commission on Wednesday. His Czech counterpart Marta Nováková (ANO) said one tender conditions would be that the third nuclear power source remain fully under the administration of the Czech Republic once finished. The intergovernmental commission also discussed mutual cooperation in supporting small- and medium-sized businesses, mutual exports into third-countries and cooperation within the aircraft industry. By Reuters Russia is ready to take part in Bulgaria’s Belene nuclear power plant project if such a possibility arises, Russian Prime Minister Dmitry Medvedev said on Wednesday. India and Russia are set to sign a $3 billion lease agreement for a nuclear-powered attack sub on March 7, according to local media reports. The Diplomat, By Franz-Stefan Gady, March 05, 2019 India and Russia are expected to conclude an intergovernmental agreement for a 10-year lease of a Russian nuclear-powered attack submarine (SSN) this week. The deal, estimated to be worth around $3 billion, will likely be inked on March 7, according to sources cited by The Economic Times. Neither the Indian nor Russian defense ministries, however, have officially confirmed that a signing ceremony will be held in the coming days. This will be the third instance of a Russian submarine leased to the Indian Navy by Moscow. In 1988, the Navy inducted a Project 670 Skat-class (NATO classification: Charlie-class) nuclear-powered cruise missile submarine, rechristened INS Chakra, on a three-year lease. In 2012, a second INS Chakra, the retrofitted K-152 Project 971 Akula-class Nerpa, was leased for 10 years. The Chakra was officially commissioned by the Navy in 2012 and currently serves with the Eastern Naval Command. India and Russia are currently discussing extending the lease for another five years to 2027. A U.S. uranium company set up shop at CPAC and started spreading Clinton scare stories. The Daily Beast, Lachlan Markay, 03.03.19 A leading U.S. uranium producer is confident that President Donald Trump is going to crack down on its foreign competitors. But in the spirit of not taking any chances, the company rented space at the annual Conservative Political Action Conference, enlisted a top Trumpworld public relations executive, and invoked a well-worn Trump attack line on his 2016 campaign opponent to try to nail down a policy win. The Texas-based Uranium Energy Corporation posted up in the exhibition hall of the annual conservative confab this week, where it courted conservative activists, radio hosts, and at least one senior White House official with its pitch to crack down on foreign competition in the name of national security. Specifically, the company is pressing the Department of Commerce to impose quotas on uranium imports that would carve out a quarter of the market purely for domestic producers. The department is scheduled to present its findings to President Trump in April, when he will decide whether to invoke his authority to impose “national security” trade restrictions. UEC’s pitch isn’t just boilerplate national security or protectionist rhetoric. It has something most other companies vying for attention at this year’s CPAC do not: an opponent that’s been repeatedly called out and demonized by President Trump and his allies—Uranium One. A Canadian company, Uranium One is a major uranium importer to the U.S., which pits it against UEC’s policy agenda. It is also a boogeyman for conservatives, who believe that then-Secretary of State Hillary Clinton shepherded its acquisition by Rosatom, a nuclear energy company owned by Russia’s state atomic energy agency, after Uranium One’s chairman donated millions of dollars to her family’s foundation. The conspiracy theory fails to account for the fact Clinton was just one of a board of nine federal officials who signed off on the deal. But that didn’t stop Scott Melbye, UEC’s executive vice president of Uranium Energy Corp, from warning about it while manning the company’s booth at CPAC…….. The UEC company’s presence at CPAC underscores the ways in which private interests frequently attempt to leverage the conference, and its influential attendees, often by tailoring communications and advocacy strategies to the pet issues and causes that animate the moment’s conservative voters, activists, and officials. UEC wasn’t listed on the conference’s website as either a sponsor or an exhibitor. But a source familiar with its work there said it signed on late as an exhibitor—the lowest level of CPAC sponsorship—which comes at a $4,000 price tag. Helping to organize UEC’s CPAC presence was Alexandra Preate, a public relations executive who works closely with former White House strategist and leading protectionist Steve Bannon, who formerly ran the pro-Trump website Breitbart. Also mulling about UEC’s exhibit was Matt Boyle, Breitbart’s political editor. ………. 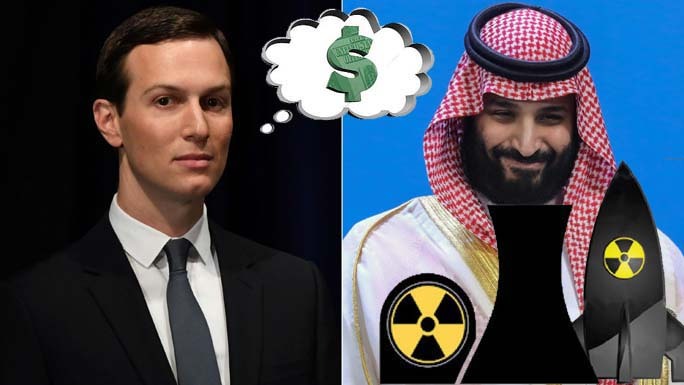 Trump’s son-in-law, Jared Kushner, helping Saudi Crown Prince towards getting nuclear weapons? No one knows whether Prince Muhammed will manage to succeed his father and become the next king, for there is opposition and the Saudi economic transformation he boasts of is running into difficulties. Trump and Kushner seem to be irresponsibly trying to boost the prince’s prospects, increasing the risk that an unstable hothead will mismanage the kingdom for the next 50 years. Perhaps with nuclear weapons. nuclear division, which could fetch up to £200m. Rolls-Royce’s retreat from civil nuclear work reflects the industry’s broader problems. Plans for new power stations in Britain have been left in tatters after the Japanese industrial giants Toshiba and Hitachi withdrew, leaving just Hinkley Point in Somerset under way. project to develop small reactors or its nuclear submarine reactor business. Rolls-Royce has been in talks to install its equipment at a plant in Essex planned by China General Nuclear, to help assuage security concerns. This work is likely to be transferred to the new owner. Sources said the business, which has more than 1,000 staff, was likely to go to a trade buyer. A Chinese deal is unlikely.